Imagine an “Open that Bottle Night” — a dinner where you open a special wine that you’ve been meaning to drink, yet never do. Now imagine: the crowd that has gathered is composed solely of wine writers, serious wine collectors, wine geeks and wine industry folks. It would be an intriguing event: amazing wines from storied vintages, lots of sharing, bonhomie and yes, some competitive bragging rights. Such a Bacchanalia does, in fact, exist: the Wine Media Guild of New York’s annual dinner, when members and guests bring prized bottles from their cellars to celebrate their common muse. 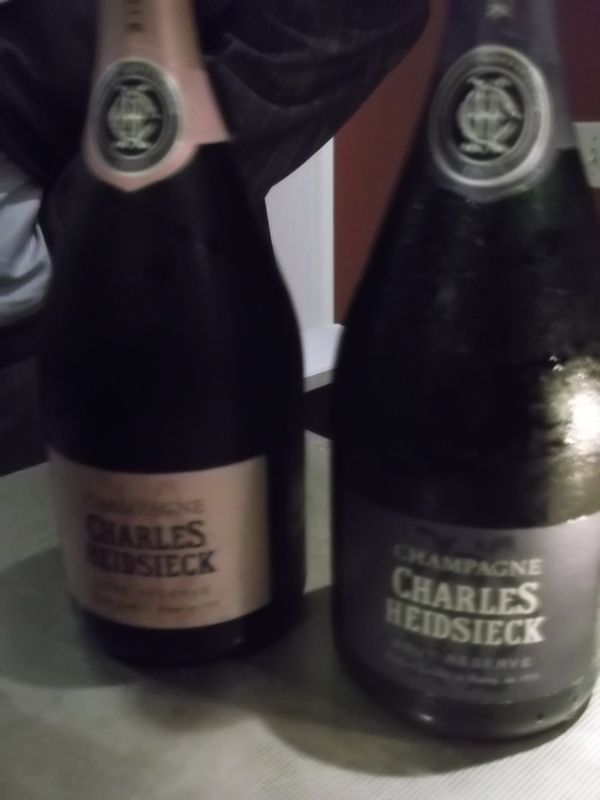 This year, the event recently took place at SD26, where the group gathered on the sleek (but sweaty, AC-challenged) second floor, Charles Heidsieck Champagnes (our aperitifs) in hand. I’m not a major collector, but I do put down the occasional bottle for aging and deferred (hopefully greater) pleasure. At last year’s WMG annual dinner, I brought the 1995 Chateau Monbousquet, which was so elegant and classic that it inspired a laudatory post. At that event, however, there were only substantial reds at my table. So, for this year’s dinner, I resolved to bring an interesting white. And for that, I went with one of my favorite appellations — Savennières, a small Loire Valley district in Anjou-Saumur. The producer: the 2001 Domaine des Baumards’ Clos du Papillon. Located on the northern bank of the Loire River near Angers, the Savennières district is minute, only some 750 acres of south and east-facing hillside vineyards, composed of volcanic schist, sandstone and granite. This salient mix of mineral soils, combined with mandatory low yields, great sun aspects and the northern (acidity imparting) latitude can yield exquisite dry, age-worthy wines. Tightly wound when young, these singular expressions of dry Chenin Blanc, the sole grape allowed in Savennières, need some bottle time. The payoff is worth it: mind-bending complexity, concentration and honeyed, floral aromatics, along with a pronounced energy and minerality on the palate. Very few white wines can compare; the Carricante-based white wines of Etna, in Sicily, come to mind, which also spring from volcanic soils. While the Baumards have been making wines in Anjou since 1634, they are considered one of the most dynamic houses in the region. And the single-vineyard Clos du Papillon — from a highly volcanic parcel, shaped like a butterfly — is a benchmark expression of Savennières. 2001 was considered a good, but not great vintage for Anjou whites. 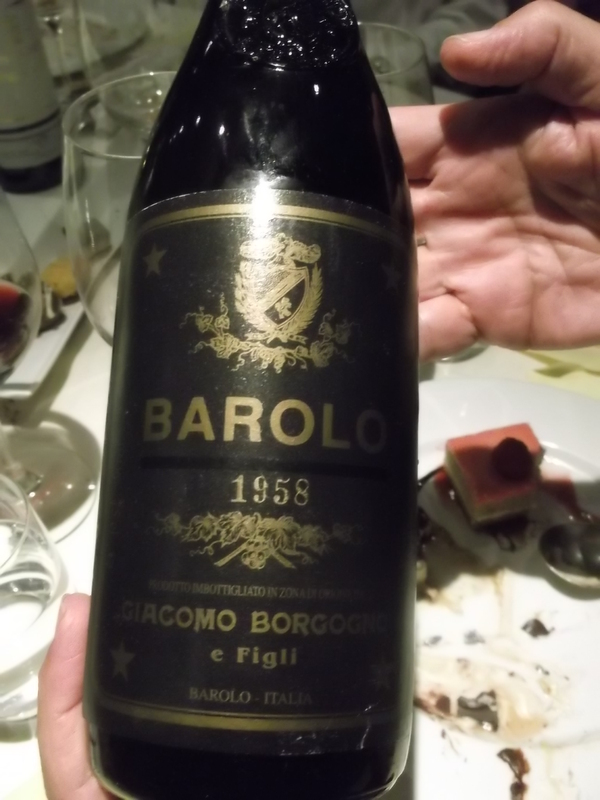 Upon opening the Clos du Papillon at the dinner, however, the wine showed obvious pedigree. A clear pale gold color, it had an expressive nose of honey comb, Calisson d’Aix and a touch of slate; on the palate, a captivating, focused energy, infused with ripe orchard fruit, clean minerality and a long, citrusy finish. Faces lit up with approval as I shared it around the table (and the room!). 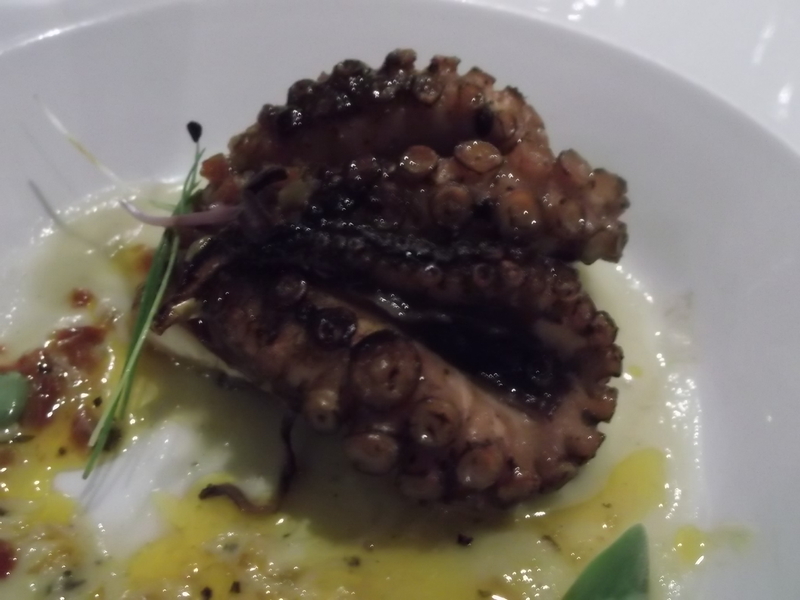 And it was a brilliant match for SD26’s grilled squid. Savennières is built for the table. The Baumard was not the only 2001 Savennières at the dinner. WMG treasurer Mary Gorman McAdams (MW) brought Nicolas Joly’s cult biodynamic, single vineyard La Coulée de Serrant, a powerful expression of earth, stone and gunpowder, which couldn’t have been more different from the highly linear and (still) fruit-laced Baumard. Same grape, same appellation and vintage, but completely different (and compelling) wines. Vive la différence. Last thoughts: Plenty of mileage left in the 2001 Clos du Papillon (assuming good storage conditions), but drinking with great pleasure right now. This entry was posted in NYC Events, Wine, Wine + Food and tagged "Open that bottle night", 2001 Domaine des Baumards Clos du Papillon, Chenin Blanc, La Coulee de Serrant, Loire Valley wine, Savennieres, SD26, Wine Media Guild of New York. Bookmark the permalink.